Women’s power generator co-operative. The generator was bought a year ago and was stored in Al-Mahatta neighbourhood in Serekaniye. It has a capacity of 900 amperes and it sends electricity to 400 houses from 1-4pm, and then the national electricity is used from 4-9pm. The generator is used again from 9pm until 1am. Eleven women have successfully formed a co-operative society by buying a power generator. 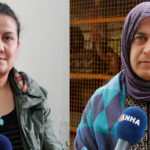 These women were previously stripped from their natural right to work and were distanced from contributing to the communal economy, but thanks to the Rojava Revolution they have reinforced the women's economy and reinstated a role for women in their society.